Includes ebook access "For the Grade 9-1 course"--Front cover. 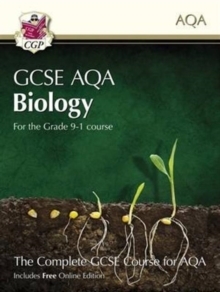 This in-depth student book from CGP comprehensively covers the Higher Level Grade 9-1 AQA exam specification for GCSE Biology. It contains detailed, accessible notes explaining every topic, supported by clear diagrams, photographs, exam tips and worked examples. Practice questions and exam-style questions are included throughout, with detailed answers at the back. And of course, there's superb coverage of the new elements of the Grade 9-1 course, including every required practical, maths skills and Working Scientifically. We've even included the AQA Learning Objectives for each topic, so you'll always know what you're expected to understand for the final exams. There's also a free Online Edition (accessed using the unique code printed inside the front cover) that lets you read the entire book on a PC, Mac or tablet. CGP student books are also available for Grade 9-1 AQA GCSE Chemistry (9781782945963) and AQA GCSE Physics (9781782945970).